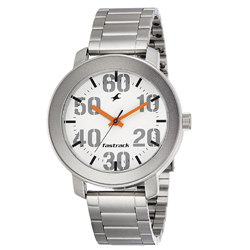 Amaze your loved one by gifting him this Attractive Titan Fastrack Analog Watch for Men and make him crave for more. This Round Shaped Metallic Watch is made of Stainless Steel and comes with features such as Water Resistance depth up to 50 meters, Analog Display and Silver coloured Case and Band. This watch is suitable for casual occasions.